Famous Writer Mumtaz Mufti mentioned an astrologer ‘Ghazi Munajim’ in his book ‘Alakh Nagri’ in the chapter of Pakistan and its future. 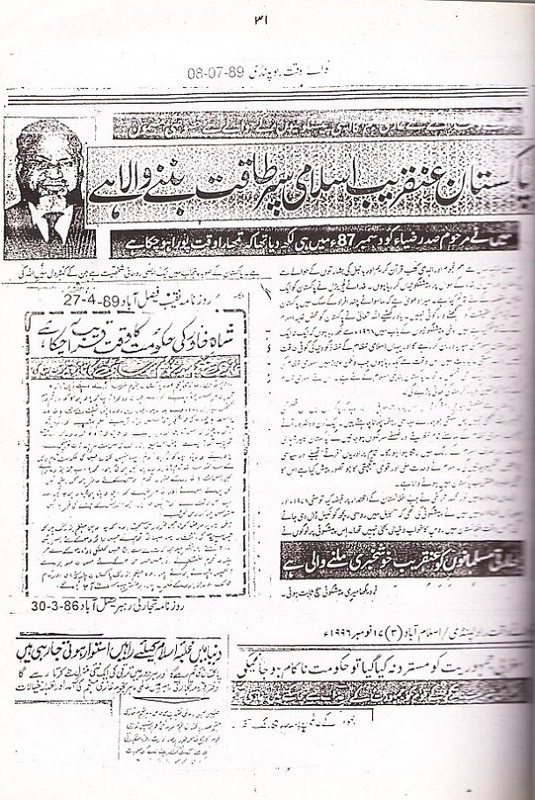 Mumtaz Mufti wrote: 'Ghazi Munajim is also predicting Great Future of Pakistan and Islamic Renaissance'. Another reference of ‘Ghazi Munajim’ is found in Faqeer Bagh Hussain Kamal RA's ‘Khutbaat-e-Kamal’ (See here) which inspired us to do a post on his predictions. 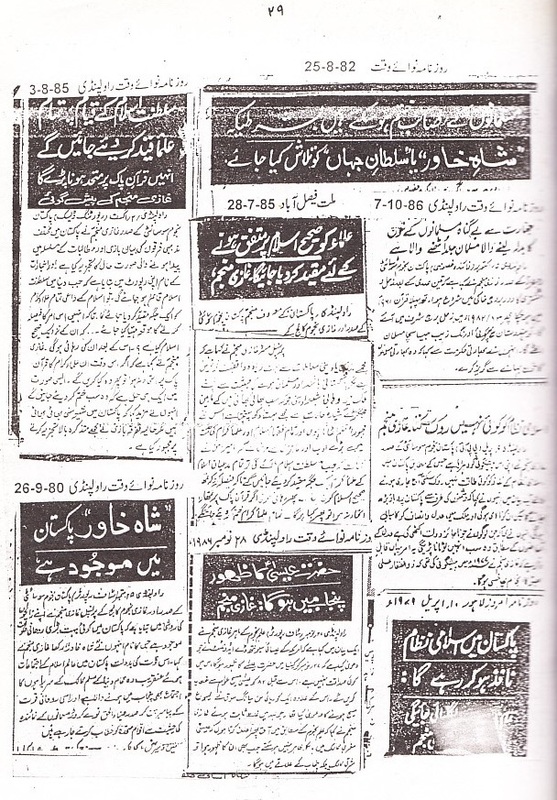 After reading below extract, one thing becomes evident that Ghazi Munajim is an expert astrologer as well as a spiritual personality and his predictions were published in many Pakistani Newspapers in 1980s or 1990s (from 1968 according to Ghazi Munajim). 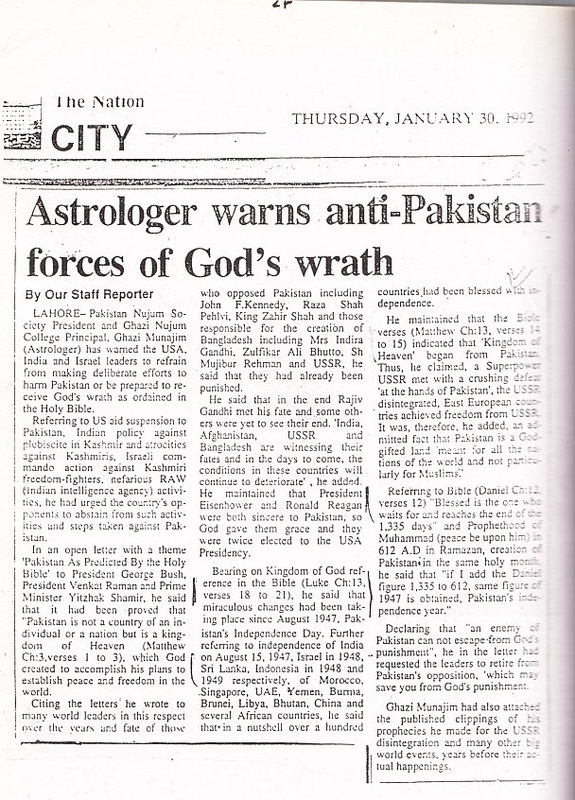 Expert Astrologer Ghazi Munajim, President of Pakistan Society of Astrology & Principal of Ghazi Najoom College. Rawalpindi. 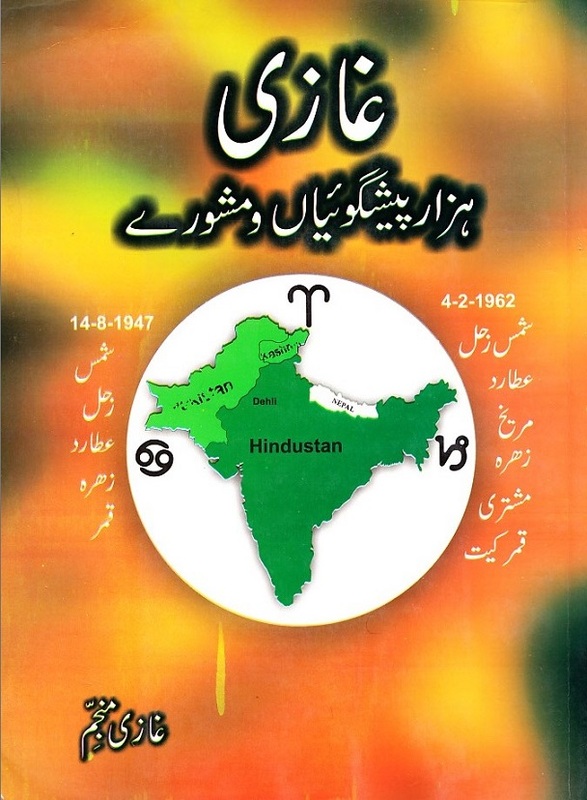 This book contains 1000 predictions and advices which Ghazi did from 1968 to 2004. 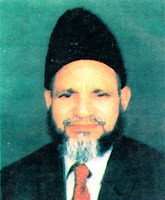 He established Ghazi Najoom College in 1970. Ghazi Munajim passed away in November, 2012 at the age of 90. Here are few pages from this book. The countries where names of the prophets are not mentioned with proper protocol are going to face a large-scale destruction in the near future, claimed Ghazi Munajam, an astrologist, here on Monday. He said those elements that are trying to disintegrate Pakistan must know that God created it and no one has the ability to make any damage to it. Ghazi Munajam said he wrote a book titled ‘Pakistan: A Country of God’ in which it was mentioned that any one who would try to disintegrate it itself would dash to the ground. As usual i forgot that in some past post, a fellow also claimed that the awaited leader will emerge from punjab. Now was my fellow claiming this from some other source or Ghazi Manajim was his source. As that was the first claim of its kind, that the awaited leader will be from Punjab, that i came across and i feel that it is not a coincidence. Secondly if he was to have been appeared in 1980's then how old will he be now as 30 yrs have passed. Thirdly what kind of Zahiri Nishanian is Ghazi talking about that are missed by us??? maslan , wo kehta hey, k khudawandon ka khudawand, aye ga. aur is k ilawa bohat si batain islam k khilaf hain, please ap Muslmanon ko jahalat ki batain na btaain. Ukal istamal karo aur phir padu.Uss nai ye nahi likha. mein dekh raha hun k comments k maamlay mein yeh post aap ko tough time dae gi. Kya ghazi saheb abhi zinda hain? aur yeh jo upar aap ne scans upload kiye hain yeh kis year k hain? 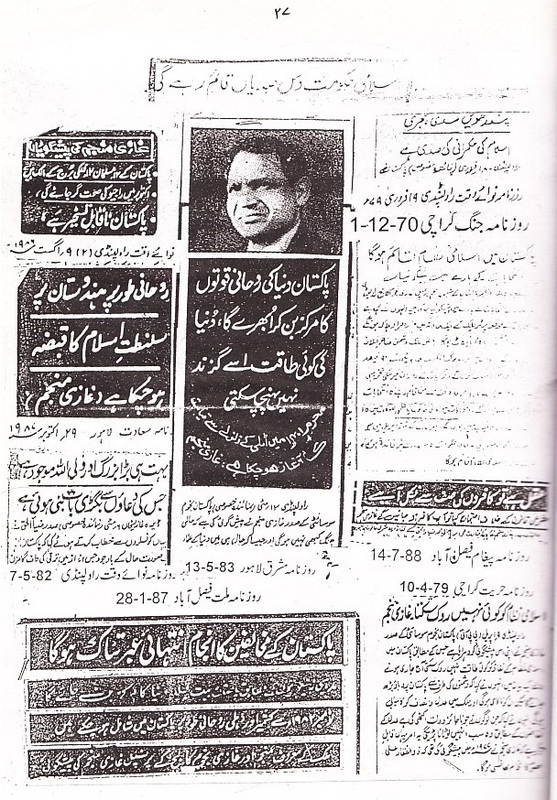 1981-1982 yeh sab hoax hai.esi ek hoax mein ne Harun Yahya ki site pe bhi parhi thi.woh harun yahya ne khud nahi kahi thi bal k kisi aur banday ko quote kiya tha jis ne kaha tha k Mahdi ALaye hi salam 1982 mein zahir hon ge. ap plz is bt ko brief kr dain...im confused..?? 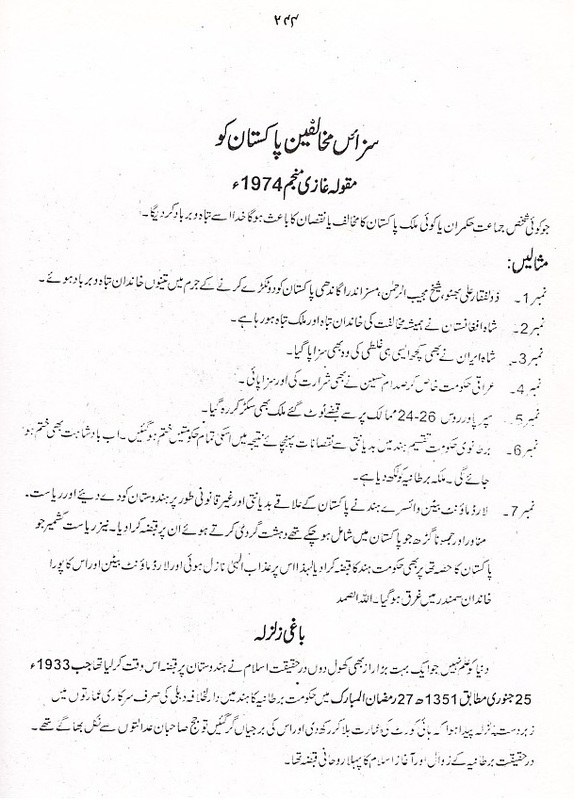 1981-1982 tak Pakistan mein ek se zada log manzar e aam per aye hain jo mehdiyat k jhutay daway daar thay. Riaz Gohar Shahi malu'un,Yousuf kazzab malu'un ne awam ko gumrah kiya. iss k ilawa kuch saal pehle,(year 2000 k baad ki baat hai) faisalabad k ek admi ne mehdiyat ka dawa kiya aur uss ki video bhi news channel per ayi thi.khabees shakhs firing ker raha tha aur sath hans raha tha. agar toh ghazi munajjam waqai christian hai toh aap ko yeh post nahi publish kerni chahiye thi.yeh comment type kertay huey mere dil mein Alhamdulillah woh ayat ka mazmun aya k jis ka mazmun hai k momino ! tumharay paas agar koi faasiq khabar le ker aya keray toh uss ki tehqiq ker liya kero. ghour ki jiye yeh hukam toh khabr k mualliq hai,toh phir pesh goyi k mutalliq ehtyat ka kya aalam ho ga woh bhi gher muslim source se? umeed hai aap iss post ko filhaal hata daen ge idhar se ,uss waqt tak jab tak k ghazi munajjam ka background na pata chal jaye. yahane Imam Mehdi ka zikar nahi ho raha.Un ka zahoor kabbah main hu ga.. I think, Ghazi Munajim is still alive as I posted 'thenew' article of 2009 link, unfortunately there is no info on net about him. Anybody living in Rawalpindi can help us. I was reluctant to do post on him but after faqeer Bagh Hussan Kamal RA' reference, I did this post because I know him from Book Alakh Nagri. I don't have answer of your questions but I must say Well done Ghazi Munajim, as he is saying Pakistan as Country of Spiritual forces, and we know, its proved by Saints also. this extract is from his book as I found it, Although I changed it, If Mumtaz Mufti and Faqeer Bagh Hussain Kamal RA didn't mentioned him in their books, I never try do this post. Give him some respect. He seems me very knowledgeable person....Lets wait and see whether his predictions comes true or not. Very well taken points as there is only one badshahon ka badshah i.e. ALLAH the GREATEST. I said this due to his wording. Lets wait for some time and see....but his predictions are in favor of Pakistan. so you are brining slowly slowly all the relative post for Imam , and might it will be some how difficult to believe and to understand for others since here on the blog our friends has some other sorts of discussion which is entirly different for Imam. You all think Mumtaz Mufti and Faqeer Bagh Hussain RA didn't know him or people didn't read him in newspaper. You all are not focusing what he said rather taking his one word, and start commenting. I know the risk in this post...but I can't hide what is truth. He is a loyal Pakistani citizen, better than many so called liberal fascists. when i was asking about the age of the person after a lapse of 30 yrs, I was asking about the age of the leader not the astrologer. Well I must admit that it is the first post that has created a sort of doubt and ambiguity in my mind due to "alfaz ka chunao" as is done in the predictions by the astrologer. Now If I post Jean Dixon, you all will become happy to read her. In fact, I have a post on Jean Dixon already but nobody commented on his believes but If a Pakistani Patriotic Astrologer says something, you think its wrong. Allah k Nabi Salla'l la ho alaye hi wasallam toh farma rahay hain k MAhdi Alaye hi salam kaalay jhandon walay lashkar mein hon ge jo khurasan se niklay ga.
agar old khurasan wali theory maan bhi li jaye toh punjab kabhi bhi old khurasan ka hissa nahi tha. aur wasay bhi ahadith ki roshni mein jamhur ka ittefaq iss baat pe hai k MAhdi Alaye hi salam ko sab se pehle hajj k moqa pe log pehchanein ge phir fatah e istanbul aur khuruj e dajjal waghera unn ki public appearance k 6 ya 7 months k andar ho ga.WALlahu Aalam. aap ek najoomi ki baat ko hadith pe tarjeeh dae rahay ho,Nauzbillah. These words are used by Astrologer himself. What can I do...If I edit, then its dishonesty on my side. May be in future we find more about him. He is principal and president, a well known personality I think. dont make it an issue of your ego. Jeane dixon ne ba wasuq taur per yeh nahi kaha k zahur e MAhdi Alayehi salam punjab se ho ga.Nauzbillah. Zaban e khalq ko naqqara e Khuda samjho mian. We already seen a Hadith from A Man with stick comes from Qahtan Tribe.....People from Qahtan scattered all over the world. What can we say. Ahadith are most authentic and reliable source for us.No doubt in it, things will occur as mentioned in these Ahadith with the Will of Allah. and you know I posted, Allama Iqbal said , Guide of time will appear from deserts of Hijaz...but Allama Iqbal also mentioned Punjab region very important.....Wait until we find some more connections. jo jo banda yeh kehta hai k zahur e Mahdi Alaye hi Salam punjab se ho ga ,woh hadith k khilaf baat ker raha hai. mein pakisttan iss liye nahi keh raha k woh patriots jo old khurasan ki theory se lipatt ker bethe hain woh foran delail denay ayen ga.halan k hadith k alfaz ko dekhen toh logical yehi lagta hai k aaj k khurasan se zahur ho warna agar old khurasan ki theory k mutabiq pakistan k shamali ilaqon ya afghanisan se zahur hota hai toh logon k paas ek hujjat reh jaye gi un ko join na kernay ki k khurasan toh iran mein tha iss liye hamein pata nahi chala. Lakin Nabi Salla'l la ho alaye hi wasallam ne jo paegham aur nasihat di woh akmal tariqay se di,uss mein koi heel o hujjat ki gunjayesh nahi. iss liye old khurasan wali theory toh ghalat lagti hai. bari tezi se paentra badla hai aap ne.upar toh aap ne likha hai k i can't hide what is truth?aur neechay yeh. sach baat yeh hai k yeh post delete kernay mein aap ki ego aaray aa rahi hai.sab ne dislike ki hai ye post. "Now If I post Jean Dixon, you all will become happy to read her." actually no one has believe on the spiritual side if it comes from our land but if its comes from Trukey or cyprus then all is truth. and moreover on one has any spiritual experince happend with them in their life but they are only seeing such experinces from others therefor how they will built the belief . if adnan say this thing might every body start commenting in the healthy ways since he is declared a philospher of new generation and most active person on this earth promoting Imam , but on the other side if some thing comes from our land then ita not turth. aap ko bhi yehi kehun ga k jeane dixon ne kahin bhi yeh nahi kaha k zahur e mahdi ALaye hi Salam punjab se ho ga,jab k yeh shakhs ghazi khullam khulla keh raha hai. Aamad nahi bal k zahuur k mutalliq keh raha hai k punjab se ho ga.
kya yeh khilaf e hadith nahi ? Your post made me confused that whether this leader will be from Punjab or not. Now there are two things a)Leader of all Ummah i.e. Imam Mehdi b)another leader who will be the greatest support i.e. ghazi-e-Ghazwa-e-Hind who after Hind will join forces with Mehdi. So you are talking about the leader of point b) as leader a) in my humble opinion wont be from Pakistan. Plz also share facts which you know so that newbies like me also get some inside info. khullam khulla yeh kehna k zahur e Mahdi ALaye hi salam pakistan se ho ga,dar asal qadianiat aur gohar shahi k nazariyat ki taraf gumrah kernay ki koshish hai. ab yeh nahi pata k ghazi saheb ne yeh daanista kaha ya phir woh apne alfaaz ki sangeeni ko samajhte nahi thay aur unhon ne ghazwa e hind aur Aamad e Mahdi Alaye hi salam k mutalliq detail se nahi parha tha aur unhein donaun events aur un k sequential events ka difference nahi pata tha. App ki itlaa ke liye Jean Dixon ne jo illaqa btaya woh taqreeban Pakistan hi banta hai. Ghazi Munajim mentioned 1962 in above post, exactly same year told by Jean Dixon....Plz do some research on Jean Dixon predictions.....You will find them. We are happy if Imam comes from Hijaz or any other country. Do you have some specific area in your mind? You can tell. Appearance and living are different for me. Controversies or no controversies, this blog is the best find of 2011 for me though i have started following the debating comments in the last month. B/w kids, office, wazaif and reading (core points of my life) whenever i get even 5 minutes to open Future of Pakistan, it freshens me up. May ALLAH bless you all!!!!!!!!!! Seeing Future of Pakistan from All degrees and angles. :) From Hijaz, Turkey, Afghanistan and now Punjab....Well, If you become bore from these predictions, I will start Tashreeh of Allama Iqbal Poems one by one. waqt usi qoum main yani bani israeel main Hazrat Moosa a.s. paida huwey . elime najoom ko islam k mutabiq use karna chahye, na k shetan k mutabiq. bohat se logon ko ALLAH WALON KI SHAN KA PTA NAHI HEY. K RUHANIYAT WALON KI SHAN KYA HOTI HEY AUR ELM K PARAKOO LOGON KA MAQAAM KYA HOTA HEY. k ap saheb e karamat wali hain . nahi they aur na hi door door tak kahin badlon ka namo nishan tha. aasmaan bilkul saaf tha. ye farma kar AALA HAZRAT .r.a ne AAsman ki taraf apni ungli se ishara farmaya aur aanan faanan badal ban gaye are usi waqt barish bars gai . ye hota he elm najoom aur ruhaniyat main faraq. I have done a great research on these topics. But for all my fellow brothers keep in mind. "The time difference between our world(Alam-e-Nasoot) and in hidden world(alam-e-barzakh) is very important. One minute in Hidden world (alam-e-barzakh) is equal to 500 years of this world. " So always do remember If anyone sees the near future in the other world (kashf) that doesn't mean that will be occur soon. But there is some possibility if seer(kashf) brain speed is nearly approaches to hidden world then the time difference he can judge and can predict approximately 99%. "Imam mehdi will be appear in 1500 hijri." This is the exact time. Before that very bloody wars. aap theek keh rahay hain lakin masla yeh hai k kuch logon ne iss baat ko belief bna liya hai k Imam Mahdi Alaye hi salam zahur k baad pakistan mein jalwa farman hon ge,halan k yeh baat 100% wasuq se nahi kahi ja sakti. kuch log iss se bhi 2 hath agay nikal gaye hain aur unhon ne kaha hai k unn ka zahur he Punjab se ho ga.
jab punjab se kisi rehnuma k anay ki baat ki jaati hai toh zehan mein ek naam toh aata hai lakin behrhaal controversies uss naam k sath bhi bht zada jurri hui hain,haqeeqat wazeh nahi ho saki aaj tak. 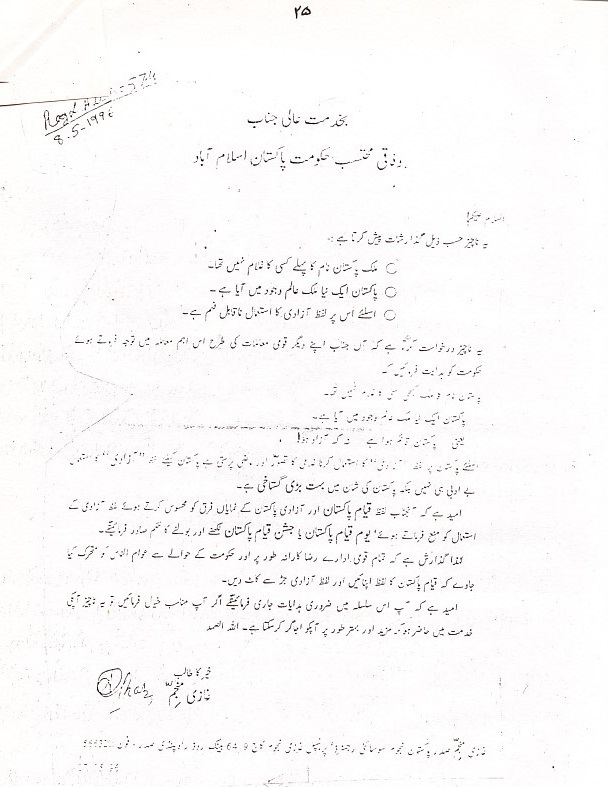 lakin yeh baat toh tae hai k imam Mahdi alaye hi salam ka zahur pakistan se nahi hona aur na he yeh baat 100% yaqeen se kahi ja sakti hai k unn ka markaz e khilaaft yani capital state pakistan mein ho ga.
@"1981-1982 yeh sab hoax hai.esi ek hoax mein ne Harun Yahya ki site pe bhi parhi thi.woh harun yahya ne khud nahi kahi thi bal k kisi aur banday ko quote kiya tha jis ne kaha tha k Mahdi ALaye hi salam 1982 mein zahir hon ge." Yes Harun Yahya and Sheikh Nazim said Imam Mahdi will appear in 1979/80 (start of hijri 1400). It is not appearance to public as Imam Mahdi but it is time when he will start his intellectual struggle with his companions against Atheist philosophies like Communism. The Prophet (saas) said: "People will gather around Hazrat Mahdi (as) in the year 1400." By Allah’s leave, Hazrat Mahdi (as) will begin his work at the age of around 35-40. When he first appears, aged around 40, people will not initially realize he is Hazrat Mahdi (as), though this will be understood in time. Hazrat Mahdi (as) is not, as some people have maintained, someone who will have ethereal characteristics that identify him as soon as he appears, someone invulnerable to the atom bomb, tanks or artillery shells, or with angels clearly seen on a cloud above his head. The appearance of angels takes place only in the world of the angels and is visible only to them. (Allah knows the truth.) And there is no such description of any such Mahdi in the completely reliable hadith of our Prophet (saas). Under the holy law of Allah, every human being created is subjected to testing. No prophet has ever had such ethereally attributes. Hazrat Mahdi (as) will be recognized through his many successes brought about by Allah using him as a means. Allah will use him as a means in bringing the moral values of Islam to prevail across the world, and will introduce Hazrat Mahdi (as) to people. However, it will only truly be realized that he is Hazrat Mahdi (as) when the Prophet Jesus (as) prays behind him under his imamate. Then people will say, “Allah knows the truth, this person is Hazrat Mahdi (as)”. Plz wait....some things are still hidden. I agree Imam AS will be appear from Hijaz but he has deep connection with Pakistan.... Now I am remembering an important saying said by Ghous ul Azam (Hazrat Abdul Qadir Jilani RA). Plz wait for few days...I will post this. The leader you r talking about from punjab, will he work for revival of Islam in pakistan?? (Not mehdi, of course). Can u tell about it as i m not clear as whether this leader will be a spiritual person visibly (from his outlook) or an ordinary leader as far as his beleifs are concerned. If you had been following the sohbats of Maulana Sheikh Nazim QaddasAllahu Sirrahul Aziz,you would know that he mentioned it dozens of time that Syedna Mahdi ALaye hi Salam will be sahib ul karamat.Jinns and angels will be his protectors and they are protecting him at the moment.When he'll say takbirs,istanbul will be conquered and he has mentioned many other things over the decades which show his (Syedna Mahdi's) supernatural powers .May Allah bless him.aamin. I'm sorry but it is the basic difference between deobandi school of thought and swad ul azam.Deobandi school thought focuses only on the material aspects which can be justified by the simple physical laws. While swad ul azam gives the Holy ones and the noble ones their due respect. I have added a note at the top, Please try to understand why all forces of evil are gathered around Pakistan, the astrologers in west told them that Pakistan will be upcoming superpower so they are imposing a war on Pakistan at all fronts. The pace of new posts has really accelerated but dont made mere promises of a new post in advance as then i start counting the days for the new one as in your above comments about Ghous-e-Azam, plz tell us now if it is connected with this topic. I hope u wont mind our demands as we say whatever comes into our minds without realising ur efforts and some comments are pretty hard too!! I have to do a lot of research on these posts, I am like you, Job + Family...... but Islam and Pakistan is my love. I will try to do next post on Sunday. Let me confirm this from other sources as well. So much confusion that Imam Mahdi will appear in Pakistan, Afghanistan, Iran, Hijaz or Turkey??? So he will rise in Istanbul, he will go Sham, people will take bait/oath in mecca (start of Khilafat), He will conquer Jerusalem, Sindh (Pakistan), Hind (India) using help of Mansur of Khurasan (Iran and Afghanistan, Pakistan was never be part of Greater Khurasaan). So he will first create caliphate in these areas. Are many predictions about leader from Pakistan (Punjab) in this blog wrong??? Not necessary because there are different Mahdis one is Greater Mahdi and other are lesser Mahdis. Mahdi is the posthumous (occurring after a person's death) recognition. Abul Ala Maududi (1903–1979) stated that the Mahdi will be a modern Islamic reformer/statesman, who will unite the Ummah and revolutionise the world according to the ideology of Islam, but will never claim to be the Mahdi, instead receiving posthumous recognition as such. Greater Mahdi will be Imam of lesser Mahdis and lesser Mahdis will be one of 313 companions of Greator Mahdi. Mansur of Khurasaan (Iran) will be one of lesser Mahdi. Similarly man in green Turban (Sheikh Nazim) is also one of lesser Mahdis. Q. What is your understanding of the hadith Hadrat Adnan is quoting about the man who heralds the way for Hadrat Mahdi (as) in a turban being Shaykh Nazim? A. There are different levels of Mahdi, the lesser Mahdi’s and the Great Mahdi (as), who is their Imam. Mawlana is one of the lesser Mahdi’s we know, identified as a Mujaddid, but people will never know why until after his life. He bears all of the signs mentioned in the ahadith and marks on his face, for those who can see. The man inside the turban mentioned in that narration is one who has no authority of his own, meaning spiritual authority from Prophets, but is authorized by a man of spiritual and Prophetic authority (i.e. is inside his turban). It is one of the Caliphs of a great Saint who is doing this task. ppl don't confuse.he is not imam mehdi who will emerge from pakistan.he is a spiritual personality and he is doing his work.Yes,he is from Punjab,he has announced rohani inqilaab,hindus,sikhs christians of pakistan love him.Many shias and wahabbis had reverted from their maslks.More than six thousand mashaikhs have gathered under him through roohani instruction given to them.He is peer of peers.He is working for physical grounds to be favourable. First time I heard about Lasani Sarkar. Who is this? HIS NAME IS SUFI MASOOD AHMED SIDDIQUI(LASANI SARKAR) SILSILA NAQSHBANDIA CHADERIA LASANIA. HE IS IN FAISALABAD.HE HAS ANNOUNCED BY THE COMMAND OF ALLAH AND HIS PROPHET (P.B.U.H)THAT WHOEVER WANTS RAH-E-HAQ,WILL VISIT HIM AND LEARN THE WAY OF ZIKR AND FIKR,INSHALLAH IN 30 DAYS HE WILL BE CONFIRMED ABOUT RAH-E-HAQ BY ALLH AND HIS PROPHET(S.A.W.). I PERSONELLY HAD MET SOME PEERS WHO WERE ON DIFFERENT SILSILAS BEFORE,THEY HAD EVEN KHILAFAT OF THEIR SILSILAS AS WELL BUT THEY TOLD THAT ACTUALLY THEY HAD NOTHING AND THEY NEVER HAD RECEIVED FAIZ FROM THEIR PEERS BUT NOW THEY ARE SATISFIED TOLD THEY GETTING SUCH A FAIZ WHICH THEY NEVER IMAGINED ONLY READ IN BOOKS.SECONDLY, I HAD INTERVIEWED MANY PEOPLE OF DIFFERENT AGE GROUPS FROM YOUNG TO OLD AND FROM DIFFERENT CLASSES OF SOCIETY , MOSTLY HAVE GOT FAIZ FROM HIM AND HAD SEEN PROPHET(S.A.W),BUZURGAN-E-DEENS AND OTHER PROPHETS IN THEIR DREAMS ,EVEN BOYS OF 14-15 YEARS HAD THOSE DREAMS.MANY HAVE REPORTED THAT THEY HAVE SEEN HIM DURING HAJ OR AT ANYOTHER PLACE BUT WHEN THEY REPORTED THIS IN FAISALABAD THE PEOPLE THEIR TOLD THEM THAT HE WAS IN FAISALBAD AT THAT TIME TALKING WITH THEM. Brother Imam Mahdi is in occultation so we cannot recognize him physically. Many people know Imam Mahdi spiritually and have taken Bait/oath in his hand spiritually but they don't know him physically as he didn't complete his great three tasks (correcting faith, establishing caliphate/union and restoration of Quran and Sunnah across world). Only 313 his companions know him physically. His 313 companions plus angel Gabriel (as) i.e. total 314 will take oath in mecca physically, Insha'Allah. Hard to believe. Any more evidence!!!! o bhai gMahdi Alaye hi salam bhi ek hon ge aur sufyani bhi ek he ho ga.yeh different interpretations na daen idhar. yar 2008 k baad bhi toh isaiyon ki bastiyan jalai gayee theen pakistan mein aur kuch aur bhi waqeat huey thay esay. Ghazi ne likha hai k jo shakhs zahir ho ga musalman usay Mehdi kahein ge,isai usay maseeh kehain ge. Mahdi ALaye hi salam aur maseeh yani Isa Alaye hi salam 2 alag alag shakhsiyat hain lakin ghazi ne yeh tasur diya hai k jese yeh ek he shakhsiyet k 2 naam hain aur issi wajah se jhagra ho ga.
yeh shkhs ghazi musalmanoun ko gumrah ker raha hai. aap theek samjhay.woh shakhs leader toh shayad ho,lakin Mahdi alaye hi salam nahi. g han,uss shakhs ka huliya waghera mazhabi aadmiyon wala hai aur spiritual bhi shayad ho lakin uss k spirituality mein koi ranks hain ya nahi,yeh nahi pata.aur wasay yeh ek hypothesis he hai k woh shakhs ho ga leader.chandd wajuh ki bina per na toh yeh hypothesis reject ho raha hai kafi arsay se aur na he theory ban raha hai. pichle 2,3 saal se har saal muharram mein yeh controversy uthti hai k yeh shaer iqbal ka hai ya nahi,wazahat ker daen. Mr Ghazi Munajim predicted it in 60s and he give the appearance date of that personality in 1980-81 but we know that nothing happened yet. Sarkar Ghous ul Azam RaziAllah Anhu k irshad ka be sabri se intezar hai. So you mean Sayyid Ahmed Amiruddin An Authorized Deputy of H.E Mawlana Shaykh Nazim Adil al-Haqqani is wrong???? Have you more knowledge about Hadith than Sayyid Ahmed Amiruddin, Adnan Okter and Baiduzzamman???? Is it necessary if you both don't know about anything which is new for you then it is fake??? mera maqsad yahan Syed Ahmad Amiruddin ki gheebat kerna nahi lakin ab baat yahan tak pohanch chuki hai toh mujhe saboot daena he paray ga.
Ahmaed Amiruddin Saheb ne apni wordpress wali site pe likha hai k ahl e tashayyu ka Imam Mahdi ALaye hi salam ki ghaybat wala aqeeda theek hai aur iss k haqq mein unhon ne kuch scans bhi diye hain. Maulana Sheikh NAzim QaddasALlahu Sirrahul Aziz ka aqeeda toh yeh nahi hai.ab aap he btayen ahmed ameeruddin saheb ne yeh aqeeda kahan se liya? wasay bhi pata nahi woh deputy hain ya nahi,lakin unhein zikr lead kernay ki ijazat mili hui hai apnay ilaqay mein. MAulana Sheikh Nazim QaddasALlahu Sirrahul Aziz ne kabhi nahi kaha k 3 Mahdi hon ge aur 3 sufyani.apni taraf se baatein an gharein. adnan oktar saheb apnay mann gharrat aqayed bna rahay hain bethe bethe.aur jin kitaboun ka aap hawala dae rahay hain risala e khuruj aur al aqwal al mukhtasar waghera yeh bht zada authentic aur mashur sources nahi hain. Mujhe zada nahi ek refernce dae daen jahan Maulana ne khud kaha ho k 3 mahdi hon ge aur 3 sufyani hon ge. (*) This hadith exists in a handwritten copy of the book titled Al-Burhan fi Alamat al-Mahdi Akhir al-Zaman held in the Suleymaniye Library. I think confusion is now removed that why different attributes are mentioned in Hadiths of Prophet Muhammad (saw), predictions of Auliyas and work of Islamic scholars. I didn't say that Sheikh Nazim said about three Mahdi. As you are criticizing Syed Ahmad Amiruddin and Adnan Oktar do I didn't read your message :) and will try to not reply you further. Bhai, I am Ama Jan of small kids therfore mein samjha nahin balkay samjhi!!!!! Well, in my limited knowledge, I have never come across a more absurd thing then the reference of 3 Mehdis & 3 sufyanis!! Our Prophet was very clear that out of my family will come Mehdi who will bring upon the revival of Islam. It is also plausible that he will have some sort of connection to our country or it is this that when his forces will be in need it will be the Ghazis of pakistan who will give him the support in the nick if time. there is also no doubt in my mind that golden era of Pakistan is just around the corner but to have such far fetched ideas that Mehdi will be from punjab or will do his AAmad here, doesnt make sense. It is for sure that he will be revealed during Hajj, the year in which there will be just a hand full of hujjaj due to wars etc. There fore care should be taken in commenting on such delicate subject as these are the tests of our faith!!!!! If you really want to search for al mahdi army, then it is most likely that they are the Durrani Pushtun (Bani Israeel decscendants now living in ancient Khurasan) - they have NO false beliefs and are considered even by non muslim scholars to be the "hammer of God" - people God uses to punish nations.Pakistan betrayed the taliban, maybe the army of al m,ahdi will punish the Pakistanis first. On 9th Muharram, I will do a facebook update for Allama Iqbal's poem on Karbala with English Translation but It will be on IqbalUrdu Blog. This is a historical discussion, May be people coming after our age laugh on us due to our knowledge deficiency. I know there are many controversies all over the Internet....Well Its a sign of Mard-e-Kamil's appearance as told by Allama Iqbal. Now you say who is Mard-e-Kamil...again wait for the post. Doors of Spiritual Knowledge are yet to open. Keep in mind. maslan kese jaga dajjal kana hoga,jabqe dosri hadees detail main kana hoga,khudai ka dawa kare ga waghera..
of Hazrat Muhammad (PBUH) regarding the three sufyany and three mahdi. Mere qouting from the writings of your alims does not make sense. Sister Mahdi means Guided one. We know Greater Mahdi is guided one so his helpers lesser Mahdis like Shyeb bin Salah or Mansur and person who heralds Mahdi from inside a turban (Sheikh Nazim) are also guided one or Mahdi. Al-Zahrani says, he believes Harun Yahya is Mahdi in another way. Because Harun Yahya gives Hidayah to so many people. Harun Yahya says "In that sene we are all Mahdis." Dr. Zakir Naik says "Mahdi in that sense giving Hidayah. Guiding People. ... Every Da'yee in that way brother..."
Shia are also Muslim and I don't consider them Kafir. Book Bihar ul Anwer contains many Hadith form both Shia and Sunni. I have already posted detail in this blog. Which is valid hadith in front of you. Even Muslim and Bukhari didn't report Mahdi. Link which I posted is not from my aalim. Greater Mahdi will be one who has lot of titles lion of ali, akhir zaman etc... lesser Mahdis will be his commanders who will make his path for khilafah. Many people mixed the attributes of all these mahdi like Mahdi will come from east i.e. from khurasaan... he is not great Mahdi but he will be Shuyeb bin Salah or Mansur. I meant only People are believing wrong that Mahdi will rise from Pakistan or Afghanistan... this will be any leader of Imam Mahdi or lesser Mahdi. I didn't force anyone to believe me. If you don't then ignore it or post any your research against my research. Time will prove it. Don't criticize any one. I am not spiritual one and even didn't see any dream like others. My research is based on my 10 years reading about subject of Mahdi. I think, We all need to read Ahadith Books in detail so every body exactly knows which Hadith is in which book. Knowledge of Quran and Hadith has lost from us. Yehi humari Gumshuda Meeras hai. Let the Time decide. For me, three things are important, A Leader who will go for Ghazwa-e-Hind, Implement Islam in Pakistan and Unite Muslim countries and go after Israeel........He will be our Imam. Its my opinion. Now Lets see what is hidden in the veil of the time. ISLAMABAD, Dec 2 (KUNA) -- In a bold move the military chief of Pakistan has authorized soldiers to retaliate any "NATO aggression along Afghanistan in the future." In this regard, a proposal is under consideration to re-equip the troops along the border with Afghanistan to stop any future violation of Pakistan's sovereignty, citing unnamed military officials, local newspapers reported. I admit that the Questions about who, why, what and where about Imam Mehdi are very imp. but on our home front we are facing a multitude of peril. Look at the above article--- We are taking a bold step if we will retaliate a Nato attack in future (even that remains to be seen). We have stooped so low that any one can come & attack us at will & we shall issue just rhetorics. What was stopping them to retaliate in Salala?? What were they fearing?? I couldnt get out of my mind the picture of three month old son of shaheed captain (Sahiwal) with Shahbaz shareef. Some thing is to be done & done quickly. Practically speaking - I am no radical - in the current circumstances "Jihad Har Pakistani per farz ho chuka Hai". There is no such hadith of 3 mahdis. ahadith,which nobody else approves of. They say that Quran had 40 Paarahs.Nauzbillah. They dont express these views openly,but whenever you make a debate with them they utter such things from their mouths. They have made the religion nothing but a thing to play with.They have forged the idea of birth of Mahdi ALaye hi salam and disappearance and appearance and then another disappearance uptill to the end of the times. Are they still entitled to be sited as authentic? We'll only quote those ahadith from their books which are already present in sunni books as authentic narrations,so as to emphasize those narrations. I read all of yours comments. interesting one. But I will suggest you all "IF you want to know Who is Imam Mehdi? and what qualities he has? Why he is so important? Please read the Mujadade alfe sani (RA)." As i challenged Faisal to present a single reference that Maulana Sheikh Nazim QaddasAllahu Sirrahul Aziz ever mentioned that there will be 3 sufyanis.You can't bring because these baseless theories are created by adnan oktar and ahmad amiruddin.Ahmad amiruddin believes in the ghaybat of Imam Mahdialaye hi salam,while his and my spiritual guide Maulana Sheikh Nazim does not. This proves the views of ahmad amiruddin.Oriya maqbool jan is a too optimistic person,often confusing views and ahadith.His views are'nt a proof of khurasan being Pakistan. and the book mentioned above for the hadith of 3 mahdis is'nt a proof because this book is a very non-famous non-authentic book. The problem of maududi,zakir naik,dr. israr is that they are all commonly drenched in the nasabiyyat. Maududi used an unethical language in his tafseer as well.Zakir Naik is the one who declared The Great Sacrifice of Syedna Imam Hussain ALaye hi salam as a political event only,Nauzbillah. 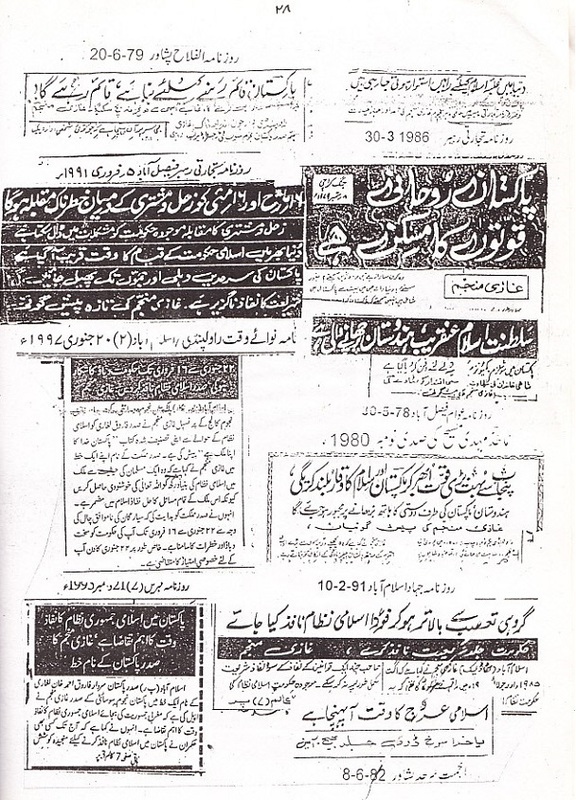 Dr.Israr is the one who narrated a false narration about Syedna ALi KaramUllah Wajhu hu deliberately. The purpose behind such statements from them may be to suppress the importance and greatness of Syedna Mahdi Alaye hi salam since he belongs to Syedna Ali KaramUllah Wajhu hu. Zakir Naik is a good debator of comparison of religions but he seems helpless when it comes to close insight of Islamic beliefs. For me,the words of Maulana Sheikh Nazim QaddasAllahu Sirrahul Aziz are an authentication since i know that he'll not say such a thing ever.He never said that we are all mahdi (Nauzbillah). We have no concern with adnan oktar or zakir naik who declare themselves mahdi. we just only listen to the words of Maulana Sheikh Nazim QaddasAllahu Sirrahul Aziz. 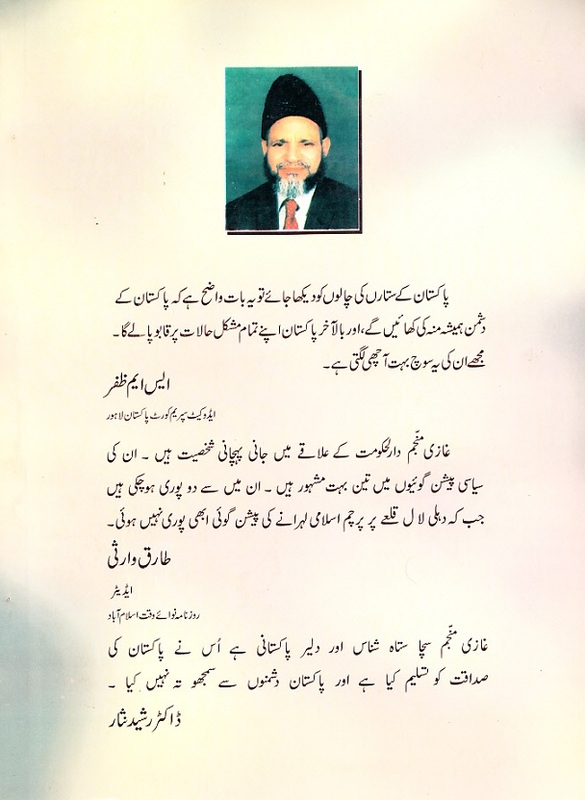 LASANI SARKAR HAS INFORMED HIS MUREEDINS TO STORE FOOD AND SUPPLIES BECAUSE IN NEAR FUTURE PAKISTAN WILL FACE MORE SERIOUS DISEASES,FEMINE AND CIVIL WAR.THE MEHFIL OF AHLE TAKWEEN IS HELD UNDER HIS SUPERVISION ON EVERY THURSDAY IN FAISALABAD. YES,HE HAS SAID THAT FUTURE OF PAKISTAN IS VERY BRIGHT BUT UNTIL AND UNLESS PEOPLE WILL NOT STRUGGLE FOR IT NOTHING WILL HAPPEN:AS QURAN HAS CLEARLY STATED THAT:KHUDA KISI QAUM KI HALAT US WAQT TAK NAHI BADALTA JAB TAK WOH QAUM APNI HALAT BADALNAY KI KOSHISH NA KARAY. IF WE WON'T DO ANYTHING THEN THE TIME AND EVENTS WILL TAKE THEIR DUE COURSE AND DEFINITELY THEN EVERYONE HAS TO SUFFER MORE.JAISA BEEJ BO'O GAY WAISA HI KATNA PARAY GA.SIMILARLY HAZRAT IMAM MAHDI A.S. KAY ANAY SAY PEHLAY ZAMEEN HAMWAR KARNI HO GI,JO KEH ALLAH KA AIK FAQEER KAREY GA.THIS IS THE MISSING CHAIN WHICH IS CREATING CONFUSION AND THIS IS WHY PAKISTAN IS IMPORTANT. kya jo baatein mein ne aap k in so-called scholars k mutalliq kahi hain ,unn mein se ek bhi ghalat reference hai? nahi na,toh ab aap btayen jin k seenoun mein ahl e bayt alaye him assalam ajmaeen ka bughz ho ham unn ko kyun scholar maanein.ham toh unhein yazeedi mantay hain jo Syedna Imam Hussain ALaye hi salam ki qurbaniyon k aetraf se inkari hain. aur aap ne kaha k Maulana Sheikh NAzim QaddasAllahu Sirrahul Aziz ne nahi kaha k 3 mahdi ayen ge.toh bhai saheb mein bhi toh yehi keh raha hun k mujhe maloom hai k woh keh bhi nahi sakte kyun k woh sahib e ilm bhi hain aur sahib e mushahida bhi. woh hargiz esi baat nahi ker sakte aur na he kerain ge. SINCE THIS BLOG IS FUTURE OF PAKISTAN INSHALLAH THERE MUST BE SOME MORAL LESSONS FOR WELL UNDERSTANDING, WHICH IS ALSO PART OF OUR FUTURE. One things which is very noticeable these days regarding the Mashiks or Sheiks of different Silasil , that their mureedains are kissing their hands or their feets with respect or might beyond the respect they have developed this thought in thire inners that our sheik is KUL ( all in all) for us . Such belief can be noticed on several silasils platforms , these day mostly SHEIKHs they give lesson that do worships only Allah and try to abstain from SHIRK and other side all these kissing hands and feet’s are still the part of their silsila and naming these activity is called AQEEDAT and they never stopped the person of doing all this, very strange . ‘’’’’’ today if we kiss some one hand and then tomorrow we will touch our hand to the eyes with AQEEDAT although its proved and there are incidents in the past that Sahaba Karama as well as TABAIEN kiss the hand with AQEEDAT ( ONCE THEY GOT BAYAT ON THE HAND OF PROPHET ASLAT O ASLAM) but after all this it was also banned and stopped since there was fear that TODAY THEY ARE KISSING THE HANDS MIGHT AFTER THIS THEY GO FOR SAJIDA TAZEEMI IN THEIR DEEP LINE OF AQEEDAT WHICH IS ALSO A SHIRK THEREFORE SUCH ACT BECOME PROHIBITED’’’’’’’’’’. 1- If he does a mistake then we will not keep something bad in our inner after noticing that mistake from him and our AQEEEDAT will not be lees for him. 2- We will not make our belief that our murshid will fulfill all our wishes and demands which is beyond the control of human, in this way we will never be desperate and we will save our inner doing any shirk. To think about the SHEIKH that my SHEIKH is with me so problems / tensions will never touch me , this is wrong because ALL POWERS , STRENGHT , IS ONLY FOR ALLAH HE IS THE ONE WHO FEED CARE AND SAVE US AND BEYOND THIS. So our sheik are also MUHTAJ of Allah, the only difference between Sheik and his Mureed is Sheik is ranked on the top level of TAQWA / TAWAKAL/ PARSAI therefore Allah love him because of these characteristics he is not MUSKIL KUSHA / HAJAT RAWA for us but he only pray for us in front of Allah with tears “ ya allah the person who came to me he is in trouble you are Rahman and Raheem and you are MUSKIL KUSHA and HAJAT RAWA , IS PER RAHAM KAR DAY RAHM KAR DAY , TUJ KO TERI BAY INTHA RAHMAT KA WASTA TU IS PER RAHAM KAR DAY OR US KI MUSKIL DOOR KAR DAY . ALLAH BOHAT MAHARBAN HA , WAZADAR HA , HAYA WALA HA , THE PEROSN TO WHOM HE LOVES HE ACCEPTED THE PRAYERS OF HIM’’’’’’’’. So as a moral duty please educate the people around you who are not well aware of the lesson of AQEEDAT in regards of SHEIKHS OR SILASIL TO WHOM THEY ARE FOLLOWERS MIGHT WITH LESS KNOWLEDGE THEY ARE INVOLVED IN THE ACTIVITIES WHICH ARE SHIRK. @"kya jo baatein mein ne aap k in so-called scholars k mutalliq kahi hain ,unn mein se ek bhi ghalat reference hai?" Allah teaches us moral rights and social etiquettes. We are instructed not to indulge in suspicion, spying nor backbiting in our daily life. The Prophet said: " Backbiting is a worse sin than adultery." It is further explained in a saying of the Prophet , narrated by Abu Sa'eed and Jubair in Bayhaqi: "Allah may forgive a person if he repents after committing adultery. However, Allah will not forgive the one who backbites, till his victim forgives him." You did backbite and curse dozen of people in this blog so you did dozen time adultery. Please don't bring sectarianism in this blog. I thing this blog is not created to defame Islamic scholars. If we believe predictions of peers and astrologists then why we cannot believe on Hadiths present in books of other sects. @"aur aap ne kaha k Maulana Sheikh NAzim QaddasAllahu Sirrahul Aziz ne nahi kaha k 3 mahdi ayen ge.toh bhai saheb mein bhi toh yehi keh raha hun k mujhe maloom hai k woh keh bhi nahi sakte kyun k woh sahib e ilm bhi hain aur sahib e mushahida bhi." If Sheikh Nazim did not say about this Hadith and I am not claiming that he said so then why you are mentioning him??? I only said his deputy said Sheikh Nazim is lesser Mahdi. If you don't consider him his deputy then it is not my problem. great and really true basis and also another kind of shirk. actaully when i had noticed this while visiting to the silasils and also watching vidoes i was just thrilled and i understand only one thing that ILAM KI KAMI ORR QURAN PAK SAY DORRI is the results of this such activities, even never allowed by my mentors to do all of suchs things strickly stopped . Aqeedat with false theories of science like Darwinism and Evolution is also Shirk. So problem of false Aqeedat is not present in only uneducated people but also educated scientists and modernize people. Aqeedat with Modernism and Materialism is also a Shirk. These theories are taught in every country as Hadith said Dajjal will enter in place and effect every person. Pagan customs (both Roman and Indian) are influenced in every country in form of Hollywood and Bollywood movies. @"They say that Quran had 40 Paarahs.Nauzbillah. They dont express these views openly... They have forged the idea of birth of Mahdi ALaye hi salam and disappearance and appearance and then another disappearance uptill to the end of the times"
Wrong concept of Shia like 40 Parah and invisible Mahdi or disappearance of Mahdi will be corrected by Imam Mahdi. All shias don't believe on extra Parahs of Quran. Actually divisions of Quran into 30 Parah was not present in time of Prophet Muhammad (saw) and Sahabas. This division is done in later ages. If anyone divide Quran in 40 Parahs then there is no problem but if anyone believe there are 10 more Parahs then he is mistaken. @"Are they still entitled to be sited as authentic? We'll only quote those ahadith from their books which are already present in sunni books as authentic narrations,so as to emphasize those narrations." If a person passes this litmus test then he is a genuine faqeer, as simple as that!!! That doesnt mean that we grant them a "mafooq ul Fitraat" status but we shall love & respect them as through the love of sheikh, they are training us for the real love of ALLAH. The pull we experience with such ppl is due to Zikr of ALLAH which they do and not due to their personal charm. Till now your comments were very informative & mature but the above comments seem to be uttered by some teenagers. There are differences & controversies even b/w siblings but "haath hola rakhen" as many like me have learnt a lot from you & r looking forward for more info. Plz watch "sufi miracle of his holiness lasani sarkar" at you tube. The point is... I dont mean to criticise anyone but what is the need of exhibitionism in order to prove your holiness when you can simply do it with your "kirdar-o-Afkar" in daily life to influence ppl in order to bring them close to ALLAH!!! Kissing hands and feet is proved from Sahaba an Imam Bukhari wrote a chapter on it but NAsir ud din albani excluded it later on. Who are we to declare it haram or shirk? and one never intends that his murshid is absolute authority but the intention behind asking them is that since they are very close to Allah,so their intercession will definitely work for us. And you can judge a person before becoming his mureed ,but once you become his mureed you have to follow him. I keep it brief here but if anybody wants to have an elaborated discussion,he may ask me in person. Sister sorry for my some aggrassive comments for Hussain. Sorry Hussain I over reacted on your comments on my beloved Islamic scholars. LASANI SARKAR IS ALIVE AND IN FAISALABAD.IT IS BETTER TO VISIT HIM PERSONELLY AND FIND OUT ABOUT HIM.DECIDING MERELY ON OTHERS OPINION OR JUST ON YOUR OWN PERCEPTION IS NOT WISE. Honestly what is happening in our country its really strange and we all are aware of this. what HINDU does giving the bath to their DEVI DAVATOOO with water and milk and in our country they are giving bath to grave of our saints with ARQAY GULAB , what it seems ZID AND COMPETITION there is no such basis in our SHARIET i never read in any book or nor heard from any saint. Syed safraz said one time '''' whatever the rank of wali u allah he is just a human like us he is also Muhtaj like we are for allah, if we go to saint with this intention that he will give us ILAM or will tell us AMAL then its appriciatalbe . TO go to Grave yards only coz of our prophet Aslat o salm taught us to go there to remember your end and after end destiny .If we go to Mazar and we pray in this way ''' ya allah yeh tera naik banda tha , mahlooq ko is say bohat faida hua , tu bhi is per ihsan farma , is ko janat may ala darja ata kar ''''' this act would be very very impressive and well learnable. It is also a sign of a true wali ullah that there will be no "khilaf-e-sunnat" act/attitude in their lives. If it is so then we shall not see that is any Kashf-o-Karamat are exhibited by that person or not. I forgot, as usual the names, that a very big wali ullah A was being told about another sahib-e-ilm B. So he decided to meet him. The other person was at Kaaba at that time. When A reached there, he saw that B was sitting with his feet towards Kaaba. A imm. turned back saying that a person can't be a sahib-e-ilm who has such careless/disrespectful attitude. I regret if you jazbaat have been majrooh but i was expecting a very dignified manner in dress, address and general demeanour from a person who is working or leading the unity of Ummah. A person of this calibre need not to be engaged in such small things as you will know it better. yar yeh pseudo tasawwuf band kero asal tasawwuf ki taraf aao.aaj aap ko AuliyaUllah k mazar ko arq e gulab se ghusl daenay pe aetraz hai,kal ko Rauza e Rasool Salla'l la ho alaye hi wasallam ki zyarat aur unn k wasilay se mangnay aur unn k Roza Sharif ki jaaliyon per khushbu aur ittar malne pe bhi aetraz ho ga.
yeh kuch pakistani pseudo-sufis ne hath paer chumnay ko bhi shirk qarar dae diya hai.Allah bchaye in jaali sufiyon se jo sirf AuliyaUllah k dushmanoun ka propaganda sunn ker sahi ghalat ka faesla ker daetay hain.Jab sadiyon se AuliyaAllah ne mazarat se faez hasil kernay ko jaiz jaana hai toh aaj k daur ka self claimed sufi kis tarah uss ko deny ker sakta hai. Sarfaraz shah k khud sakhta jan nisaro ! suno ! suno ! Sarfaraz shah silsila e chishtiya mein bayat hai na.Silsila e Chishtiya k Bani Hind Khawaja Muin Ud Din chishti RehmatUllah Alaye hi Daata Saheb RehmatUllah ALaye hi k mazar pe aa ker chilla kertay hain aur fuyuz o anwar samet'tay hain yani un ko wasila bnatay hain,unn ko naqison ka peer e kamil mantay hain ,toh tum kon hotay ho iss fael pe aetraz kernay walay. Auliya k wasilay se mangna jayez hai aur bilkul ayen jayez hai. Adha tasawwuf,adhi wahhabiyyat mat apnao.idhar aao ya udhar jao.kyun k sab se nichle garhay mein roz e qyamat doghlay munafiq hon ge,yad rakhna. Yeh woh log hain jinhoun ne duniya mein faqr kiya lakin dunyawi zindagi k baad inn ki zindagi qabil e rashk hoti hai.Aur beshak asal zindagi wohi hai jahan ham time ki dimension se chhutkara paa lein ge. Tu,haray kisi qalbi dost se koi aqeedat rakhay,muhabbat keray toh tumhein khushi hoti hai ya nahi? Toh woh jo Khaliq e Kainaat hai aur Maalik e Kainaat hai uss k doston se aqeedat rakhnay ,unn k mazar ko arq e gulab aur khushbiyat se ghusl daenay ko Nauzbillah tum devi devtaoun se mila rahay ho.Sharam kero.Kis jaali sufi ne yeh pattiyan parhain hain tumhein. Jo Allah k auliya se bughaz rakhta hai ,unn se dushmani ka izhar kerta hai Allah ka uss se elan e jang hai.Allah k auliya ko aqeedat daenay k amal ko devi devtaoun ki puja se tashbih daena (nauzbillah ) bhi izhaar e bughaz hai. No post, no comment is deleted. Read latest post about Ghaus-ul-Azam and his message to Hayat-Al-Meer and how it links with Pakistan. Tum logon ne toh silsila e chishtiya ka rang jaana he nahi.Mein Silsila e chishtiya mein baqaida bayat toh nahi lakin yeh zarur janta hun k jis din tum silsila e chishtiya ka asal rang dekh lo gae,uss ka method of working daekh lo gae,mujhe darr hai k tum iss silsila pae bhi aetraaz kero gay. 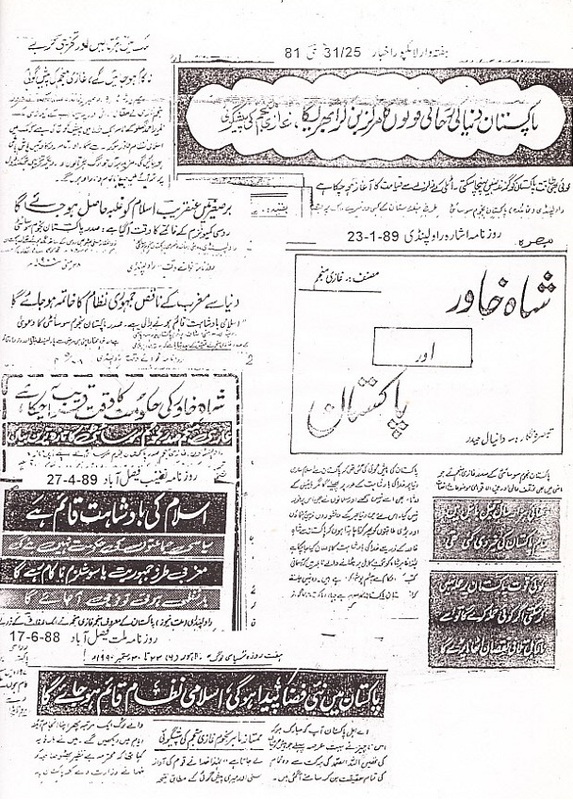 Haalan k yeh haqiqat hai k Barr e sagheer mein Islam k nifaz mein sab se eham kirdar Silsila e Chishtiya ne kiya.Riwayat hai k akele Khawaja Nizam Ud Din Auliya RehmatUllah Alaye hi ne 90 lakh admi musalman kiye apni hayat e mubarka mein.Aur Hind mein Islam phelanay mein Silsila e Chishtiya dusray silasil e tariqat se iss liye munfarid nazar aata hai k uss ne yahan k logon k culture ko samjha.Hind k log mauseeqi suntay thay toh Samaa mutarif hua hind mein.Log Ishq e HAqiqi pe mabni kalam ko jab suntay toh jhoom uthtay. Lakin afsos k aaj k jaali sufi inn rasmon ko jo k bht arsay se chal rahi theen,unn ko shirk aur haram qarar dae diya hai. Syed Sarfraz Shah, pehli class ke students ko aur kya bataen ab? Un se ilm hasil krne to koi jata nahin, sub minatain muradain puri krwane jate hain, I think. Koi rohani Ilm lyne jaye to shaid woh bta dain. Got my point. I have listened many of his lectures. He hasn't said like this. Listeners ka level bhi bohat count karta hai. What you said is true about syed sarfaraz ahmad shah Sahib. May be we are not on a level to percieve him correctly. Whatever we r saying are our own & personal views & they dont mean that Shah sahib has mouthed these things. b) To visit the mazar of a Wali Ullah in my city, To pray for him and to request him to pray to ALLAH for this nachees i.e. me, so that ALLAH bestow his Rehamt on me. Thats all!!! Is there any controversial issue??? His msg. is very simple but as Faqar said that it is the listener's aptitude that how he/she tunes to it. Wake up plz, the wait is about to be over!! Han wasay yeh baat bhi hai.Yeh maedan toh esa hai k yahan Post doctorate walay bhi sahib e ilm honay ka dawa nhi ker saktay toh phir pehli jamat walon ko kya haq pohanchta hai k uth ker shirk aur haram aur biddat k fatway laganay shuru ker daen. Bayat ek term hai jo ruhaniyat k ilawa khareed o frokht se bhi mutalliq hai.Aaj kal ki dunya ki khareed o frokht ki tarah iss ruhani duniya ka bhi yehi asool hai k apna tann mann murshid ko saunpnay se pehle yani uss ki bayat kernay se pehle uss ko jitna parakhna chaho parakh lo,lekin ek dafa achi tarah jaanch kernay k baad apna tann mann uss ko saunp diya toh phir aap k rights nahi rehte k aap apnay owner ko judge kero. Abhi teer aur bhi baqi hain ,mere tarkash mein. Because Iqbal apna kashf HAzrat Mujaddid Alf Saani QaddaSAllahu Sirrahul Aziz se mansuub ker rahay hain. So Ghazi sahib ki false prediction toh Alhamdulillah farigh ho gayee iss nazam ki roshni mein. i ask you whats wrong in erforming dhamal with the sincerity of heart,whats wrong in giving the mazar ghusal with arq e gulab?How can one believe in tasawuf,respect auliya and at the same time declare it shirk or haram to kiss the hands of the murshid or to give the mazar ghusal with arq e gulab? Kindly read all my above comments. I have nowhere written any comment on this topic which u have mentioned in ur last post because as a matter of principal i dont go near anything or say anything about which either i am not clear "ya jis mein kisi shak ki gunjaish ho". Well, well, i dont know about ur school of thought but my mentor has given me the lesson to be humble & to receive criticism with patience as it doesnt let your ego to flourish. you did not understand my point of view so no comments. for me UMAL TAWAWAF / UMAL SHARIET / UMAL TAREEQAT / UMAL HAQIQAT / UMAL MARIFAT is only QURAN PAK, there are some time things we need to consult to undertand their true spiirt so Sufis and Aulias are there who make clear that Quranic messages which we find out in such books. there is no compitition at all in any silasil as you mentioned sislay chictiya and i am also a follower of one of them . I only know one class where Allah and Rasoool subject is in teaching and for learning , one time i said to hussain if i wrote something means i am responsible of that so today what ever i mentioned i take responsiiblity with the full confidence and inshallah will remain same. I tell you one thing, we all are thousands of miles away from spiritual knowledge and Quran o Hadith. Do you know, once Mohiuddin Ibn Arabi (Rahmatullah Alaihe) fell from a Horse, and kept silencw then told to others, I am searching this incident (his felling of horse) in Quran, and I find it there....!! This is level of their spiritual knowledge and what we all Muslim are doing now? Muslims went to the depths of ignorance because we left Quran and started humiliating spiritual teachers and made fun of them so results are in front of all. Take Ghazi Munajim as an astrologer. You posted same poem link on new post so I also posted the comment twice. @"what HINDU does giving the bath to their DEVI DAVATOOO with water and milk and in our country they are giving bath to grave of our saints with ARQAY GULAB , what it seems ZID AND COMPETITION there is no such basis in our SHARIET i never read in any book or nor heard from any saint." "In the Sight of Allah, the Almighty, this concept of the "everlasting" and accordingly absolutely incomputable, has already ended. Eternity, which appears to be an unattainable concept for us, is actually just a single moment in the Sight of Allah. Yet, before proceeding with these issues, some concepts like "the real nature of matter" and "timelessness," will be dealt with in detail for a better comprehension of the above—mentioned subject." "In human life, another important mystery prevails. While mourning for someone who has died, people do not consider that they, themselves, have also died and even been resurrected. The birth and death of a person occur simultaneously. Even trivial details about all people's lives, deaths, resurrections and eternal lives are retained in the Sight of Allah. In other words, everything is taking place right at this moment. Death and resurrection are truly not incidents occurring at distinct times. People are born in timelessness. Likewise, they die in timelessness, they are resurrected in timelessness and, as a matter of fact, just at this moment, they are alive. By the moment Allah creates man, he becomes an eternal being. To put it another way, he starts his endless life, becoming alive for all eternity. Meanwhile, he also witnesses his own death as a single square. Just as he sees himself alive all through his life, he witnesses his death, but only on one occasion." It has been related by a group from the Salaf (Pious Predecessors), in many narration's, that these five deities were righteous worshippers. However, when they died, Shaytaan whispered into their people to retreat and sit at their graves. Then Shaytaan whispered to those who came after them that they should take them as idols, beautifying to them the idea that you will be reminded of them and thereby follow them in righteous conduct. Then Shaytaan suggested to the third generation that they should worship these idols besides Allaah and he whispered to them that this is what their forefathers used to do! So Allaah sent to them Nooh ’alayhis-salaam, commanding them to worship Allaah alone. However none responded to his call except a few. Allaah - the Mighty and Majestic - related this whole incident in Surah Nooh. The likes of this has also been related by Ibn Jareer, at-Tabaree and others, from a number of the Salaf (Pious Predecessors) - radi-Allaahu ’anhum . "what HINDU does giving the bath to their DEVI DAVATOOO with water and milk and in our country they are giving bath to grave of our saints with ARQAY GULAB , what it seems ZID AND COMPETITION there is no such basis in our SHARIET i never read in any book or nor heard from any saint." mein AK aur NN se darkhawast kerta hun k next time woh jab bhi sarfaraz shah se milein ya kisi aur ruhani shakhsiyat se milein uss se wazeh lafzon mein puchein k k ya iss tarah ghusal daena shirk hai ya biddat e saiyyah hai? umeed hai k 95% se zada ruhani logon ka jawab ho ga k nahi.aur wasay iss mamalay mein ibn e qayyam jese sakht tareen mauqaf rakhnay walay aalimoun mein se ek hain aur jinhein wahhabi bht quote kertay hain,unhon ne kitab ar ruh mein woh ahadees jama ki hain jin se saabit hota hai k murdon ko salam kiya jaye toh woh jawab daetay hain aur woh hamari khushiyon pe khush hotay hain waghera.Means k unn ko bhi sab feel hota hai.Toh esay mein agar Allah k ek wali k mazar ko ghusal diya jaye arq e gulab se toh kya woh khush nahi hon ge? YAr mein ne toh aap ko pehle he bola tha k MAhdi ALaye hi salam ka zahur punjab se hargiz nahi ho sakta,post hata do. Lakin kher aaj yeh bhi cnfirm ho gya k Mahdi ALaye hi salam toh kya,woh leader jis ka pakistaniyon ko intezar hai woh bhi punjab se nahi ho ga.
but it is sure, that leader will travel to many cities and countries. May be he come to Punjab also and Ghazi Munjim through his astrology, made some calculations. the message was not that what hussain described ,and what was my point of view just only the customs and the ways teating the Mazair aulia from the mureedanin and innocent people is not the correct way . I see that over night, many prblms have been solved, most of puzzles decoded and almost all mysteries unveiled. In one of my previous posts i said that the leader we are awaiting is not from Pakistan but Afghanistan. Now i am stating again that Imam mehdi might be from Iran while our awaited leader is an afghan or Pushtun. this post did'nt help me to reach a conclusion.i was always clear that Syedna Mahdi Alaye hi salam will not appear first from punjab as ghazi mentioned. Note: I believe we are discussing Greater Imam Mahdi Akhir Zamaan, not his minister or helpers or lesser Mahdis. Special Note: As Mahdi is the posthumous recognition so we cannot find him as Mahdi before his success and achievements. So we should do effort for completing his tasks without recognizing him. Yes we are discussing Imam Mahdi Akhir Az Zaman. I agree with this that we will recognize him after his achievements and success as he will not say I am Mahdi. There are narrations that when Mahdi Alaye hi salam will appear a voice will come from heavens "Hadhi hi khalifatullahi Mahdi " i.e. This is MAhdi ,caliph of Allah. Dont know how authentic is this narration,but most probably it is from sahah e sitta and the point to mention it here is that not only saints will recognize him but there will be much more to make people aware that Syedna Mahdi Alaye hi salam has appeared. lets wait what he will do and from where he will take start of his achievments, and i also beleive that if he alreayd got birth and whatever is his age right now might all the saints and specially AHLAY TAKWEEEN recognize him well . can i ask one question today we have alot of ahlay ILAM / ULAMA / SCHOLORS / AHLAY FIQA & HADIS very very intecllectuals around the world where ever the eyes goes we found them , they all are calling for PEACE PEACE AND PEACE so what Imam would have difference with them either he would have spirtiaul powers or he would have ILM LUDNI OR something else , in order to have confession from all these intecllectuals that they will beleive him , on his words on his acts in this modren age. one time i remember i was watching PC TV and there was on incident the man appeared and claimed he is IMAM MAHDI and the host i forget his name and he told him that Imam Mahdi will speak arabic and so you are not speaking arabic iam sorry if i m missed somehting in this . so afer seeing this i thought then what Imam will be among of all these the core QUALITY / CHERTERISTIC SOME THING WHICH REALLY MAKE DIFFERNCE ? but I am saying Imam Mahdi AS will not say himself Imam. I mean, he will not claim himself as Imam Mehdi. People will recognize him from signs. (People means common man/Awam). What I meant was that i think Imam Mehdi might be from Iran while our awaited leader i.e. ghazi Ghazwa-e-Hind will be an Afghan/Pushtun and he will then help Imam Mehdi at Istanbul & Palestine. The reason is that i think that ppl of Afghanistan and & our tribal areas are tested due to a reason. When ALLAH decides to put resp. on some one then first their mettle & will is tested. Therefore the ppl of these areas are so battle hardened & having love of Islam that they can fight without fear for anything as they have seen and exp. evrthng that a normal human can fear. They have nothing to lose so they can take on anyone/anything. While European/US forces yearn for their lives back home and they have no jazba to fight. Thats why the term Jihad is so vilified as West fears that once this emotion is aroused in Muslims, there is no stopping them. I must say once again that "Jihad in halaat mein her Pakistani per farz ho chuka hai". Different thing is, He will not just say through tongue, He will actually implement these things practically. aap ne theek kaha k 2 alag alag leader murad hain yahan pe. jazbaat mein aa ker bht bari baat keh di hai aap ne k 'jihad musalmanoun pe farz ho chuka hai'.agar aap ki murad jahad bis-saif se thi toh mein batata chalun k jihad esay he nahi farz ho jata hai.pehle yahan islami state qayem kero,islami qanun lao,ameer hukm dae toh phir jihad farz ho ga.
yeh kuchh sharr pasand mazhabi anasir logon ko 'jihad farz ho chuka hai' ka naara laga ker agaay ker daetay hain aur khud unn k bachay european universities mein parh rahay hotay hain. jihad kerna hai toh pehle jihalat k khilaf kero aur nafs k khilaf kero jo k sab se bara jihad hai. aur aap ne ek dafa claim kiya tha k aap ne css kiya hua hai toh aap ko toh pata he ho ga k musalman jab hindustan chhor ker afghanistan pohanchay toh afghaniyon ne unhein qabul kernay se inkar ker diya tha. aaj bhi 3 million afghani uss so-called "mard e momin" ki wajah se pakistan ki economy ko deemak ki tarah chaat rahay hain. aap ko shayad yeh bhi yaad ho ga k jab pakistan ne UNO ki membership k liye apply kiya tha toh inhi hamaray 'dard mand ,ghayoor musalman' bhaiyon ne hamari mukhalifat ki thi. Afghaniyon ko sirf pahtuunun ya hazara braadri se thori bht hamdardi hai,warna toh unn ka wohi hisab hai k jis thaali mein khana ussi mein thuukna. Aaj bhi jo afghan youth mein pakistan k khilaf jo ghussa aur nafrat paai jaati hai,uss ka andaza nahi hai aap ko. esay halat mein jab jihad ham per farz nahi hai toh ham kyun khud ko kisi ki khatir mushkil mein daalein jab k woh hamari qurbaniyon ko acknowledge bhi na keray aur hamari mukhalifat kerta rahay.? Dear brother, I didnt claim to have done CSS as this is a fact and what benefit does it get me when i am writing anonymously as i feel i can vent out with more freedom this way. Secondly if you remember this then u will also remember that i said that i thought that we are "know all" but the real knowledge was hidden from me and after a long battle against all odds, it was a blessing that i got to Syed Sarfaraz Ahmad Shah Sahib & the first thing he said that Masha ALLAH very intelligent ppl r coming to see me & i replied that if i qualify CSS 10 times i will still be on the first rung of the ladder which takes us to ilm-e-ludni. It is his dua that in this past year i have come across accidentally (for me, but not for my mentor) on all things which have helped me on this path. Andddd "Future of Pakistan" plays a very big role in that, as, whatever i read in article as well as comments, i immediately try to do my own search and it enriches me. You see i was a student of IR, very worldly wise, into books, music etc but it took just a single meeting with Shah sahib and my condition was exactly like of Mumtaz Mufti in Alakh Nagri after he visited the grave of Qibla Sarkar. Sorry for taking space as this is the amanat of our country but i dont know why brother hussain is so cynical. c) your comments regarding Afghanis r absolutely right but what do you say about the time in 90's when our policy was right and our borders were the safest on west during Taliban regime. So we have to make our priorities clear and counter Indian influence. Insha'Allah people of Afghanistan, Iran and Pakistan will help Imam Mehdi at Istanbul, Palestine and India. Here we all doing Jihad for better future. well even if you comment with your name,it does'nt make you unsafe.You can still express your views clearly. Well policies opted in 90 went extremely against Russia.If we had taken a neutral or close to neutral approach like india,we'd be enjoying double benefits and The world would have been still divided in two poles probably. Taliban expressed themselves as true Muslims,but the truth is that they did'nt deserve the emirate of Afghanistan since they had'nt enough knowledge of Islam. And they were the part of UNO,if i'm not wrong.when you become part of such forum you have to abide by its resolutions etc. And deciding future policy,one should remember the previous record of its neighbours as well,which unfortunately we did'nt. this is the result of a few wrong steps which we took. Today we are talking of giving Gawadar to China,but if we had given its administrative control to Russia it would be probably in our interest. Pakistan's only steel mills has been functioning due to co-operation of Russia.Bhutto was hanged because he was clever enough to struggle hard to maintain the bi-polar system in the world. @"It is amazing that people are going to ''help'' Mehdi AS....... really amazing.........."
Always present to pick on -ive issues while never there for +ive approach & support (for this country & this blog). always ready to prove this land a paradise of dreams.Never there to face the reality and the real truth. One can't bring a change with mere his thinking.Practical steps need to be taken. The motto of the optimists is "hope for the best, prepare for the worst" as ALLAH says that never give up hope. What practical steps are taken by the realists so they might be followed!!! dont filter out just one verse.Allah also says that He does'nt alter the state of a nation unless they change themselves. And as far as practical steps are concerned,realists have at least assessed the potential dangers and put forward the solutions but optimists probably want to stay with present lifestyle and yet enjoy the prosperity etc. We believe in "Hope for the best & PREPARE for the worst"
So cynics have taken the practical step of ASSESSING the situation!!!!! Gooooooood. I was just wondering that my address was to everybody in general, but why is Hussain Bhai accepting this title voluntarily????? 14whee ka chand jab duniya waalo ko nazar aata hai to woh asmaan par 40 degree angle par hota haI is se pehle woh pas e parda hota hai... isi tarah IMAM MEHDI A.S is sadi kaghaaz yaani 1401 hijri me tashreef la chuke hai unka zahoor duniya waalo par jab hoga jab woh 40 saal ke hojaayenge..
i give u a hint Multan main jao or dekh lo. wo hasti Multan Sharif main hain. sheikh amin ki baat toh nahi ker rahay? Only Imam Mahdi will be above all Wali Allah and according to Hadith he will rise in western large city and migrate to Makkah. listen guysss... i think agar punjab se kuch aana b hai to shah-e-gharbi shayad aa jae.... means maghribi pakistan ka badshah ( means prime minister / sadar) as mentioned by naimatullah shah wali. ho sakta hy unka matlab ho achi qayadat of a man... ho sakta hai unka matlab imam mahdi nai hon. Ghazi Munajjam's predictions are about the personality which is Sheikh-UL-Islam Dr.Muhammad Tahir-Ul Qadri.He started Minhaj-Ul-Quran in 1981 and Hijri year was 1401.Now a days he Established Minhaj-Ul-Quran in 90 countries in the World.He is a "Majaddad" of this Time and also he is a great spiritual personality. Now a days he started "Inqilab" against our worst electoral system.We should support him and should be a part of his long march.Because this electoral system requires some reforms.Without changing some reforms in electoral system again corrupt peoples will rule on us. Ghazi Munajjam's prediction is about Sheikh-Ul-Islam Dr.Muhammad Tahir-Ul-Qadri. Me ne Austrology k bare me ap ka blog dekha hai, jis me Ghazi Munajjam ki Predictions bhi bayan ki gai hain. Mujhe Afsoos k Sath kehna parr raha hai k ab wo is Dunya me nahi Rahe, Allah un ko Jannat Ul Firdos me Jaga Atta Farmae, mere walid Sahab Ghazi Shahid Raza Alvi un k wahid Shagird the or ab wo un k Austorlogy k mission ko aage barha rahe hain. Ghazi Munajjam (Real Nam Abdul Yawar) November me wafaat paa chuke hain. A true "Majaddad" does not hold out two fingers in V-sign and acts like this. Also, the long march and his nationality of Canada prove him wrong also. Please be careful of such scholars, he is not "Majaddad". What a waste of time Mehdi from Punjab come on guys the Hadis told us he will be recognized In Hijaz and scholars of Syria will recognize him and he will be from the off springs of Rasul Allah i.e. what we call Syed in Pakistan and India (so what do you think people like Yusuf Raza Geelani the corrupt will be that Mehdi) and than Rasul Allah Said the help coming from Khurasan i.e. the Mujahiden not the leader and Khurasan is divided between Iran, Afghanistan and Pakistan you can say roughly areas where these 3 countries boaders meet so in Pakistan it could be Balochistan, KPK areas cornes meeting Afghanistan and Iran and people will go and do Baait with him so where this Punjab thing comes from yes may be some people from Punjab will also join that lashkar that will be going to join him. Funny thing characters like Tahir ul Qadri are also brought in as the person who except his blind followers is just a 2 number adme and i have great reservations since 1980's when in one of his interview he said he get RasulAllah s.a.w. every night in his dream and i said wow wow wow what is he talking about people wait their whole life to see a glimpse of our beloved prophet s.a.w. in their dream once in a life time and this guys is saying he see him every day and than again during the episodes of preelection campaign that he ran lots of other questionable things also showed up about his past speeches and quotes and we have people who can follow him well we have people who follow Ghulam Ahmed Qadiani types and the rest of his khalifas too so you cannnot show a path to a blind person or a blindfolded person. aoa, i agree with the abovw comment as i have read somewhere that people recognize the man during hajj n will say o we know this man. pakistan n spirtuality is something else . Can u please mention page no?